Hello. I am enjoying your site. Do you still collect pics of champion jerseys? 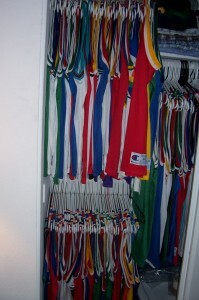 I have some jerseys that I sold on eBay as well as ones that is in my closet right now. It’s me again. I got pics,so what is your email so I can send some pics for you. But please just send photos of jerseys that you don’t currently see in the 14 teams I have posted. As I post other teams, if you have a jersey that you don’t see, definitely send along. Thanks so much! I have been looking for a directory of champion jerseys for years and just stumbled across this site. Looking forward to checking it out. Awesome site! Man, does this bring back memories and fuel the “obscure NBA jersey” conversations between my friends and I. We always send each other the most outrageous jersey or Starting Linep figures we can find as gifts. One jersey I have looked forever for and can never find is the Michael Dickerson #8 Grizzlies jersey – any idea in the world where I can get my hands on it? Thanks for the site, keep up the good work! Thanks, glad you stumbled upon it. That’s why I always loved Champion jerseys…captures a moment in time for the NBA…from superstars to role players to highly touted rookies who flamed out. Keep checking back as I slowly get through the remaining teams. As for the Dickerson jersey, it’s a tough one to find. All Grizzlies jerseys with the exception of Big Country Reeves and Shareef Abdur-Rahim were pretty much locally sold in Vancouver and printed in limited quantities. The Grizzlies overhauled their jerseys in 1999-2000, and those Champion jerseys are even scarcer due to the fact that the jerseys weren’t that exciting and neither were the Grizzlies. The Dickerson jersey was only produced in 2000-2001 (it’s the v-neck version, which was only produced that one season), so there is pretty much one limited run of those. I track jerseys regularly on Ebay and I haven’t seen a Dickerson jersey since last Fall, and prior to that the only one’s I saw were the one’s I owned and purchased on Ebay back in 2003. So you’ll just have to keep looking at Ebay. Once i get this site completed, I’m going to start a section that connects collectors looking for particular jerseys. I appreciate the reply! I Actually got a hold of the white one from a seller in Vancouver. It’s a size too small but had to jump on it for the collection regardless. My next “white whale” is a Dana Barros Celtics jersey, hopefully I can find one in a 48. Keep up the good work on the site and thanks again! Just came across your site. So very cool. I live in New Zealand and recently got into Jersey collecting. I mostly have local stuff and more recent NBA stuff but have been looking at picking up a few Champion ones recently. I’m concerned about getting burned with fakes though. Do you have any info on what to look for when spotting fakes? Thanks for putting in the time and effort to produce this site and share your knowledge. Thanks for checking out the site and welcome to the world of jersey collecting! Don’t be worried about Champion fakes if you are concentrating on replica jerseys. They aren’t lucrative enough for people to spend the time to knock-off. When buying replica jerseys, I just look for jerseys that are in good shape….no stains, no yellowing if the jersey is white, graphics that have no peeling/cracking. I also prefer jerseys that have the jock tag (the size tag on the front lower left-hand side near the bottom hem line). The label inside the neckline is often missing, so that’s not a big deal. Kids used to cut those out all the time since they were scratchy and uncomfortable. If you have ever have a question about a replica jersey, you can just cross reference with the photos on this site to validate (I promise, I’ll have all the teams/players up here sooner or later). If you are collecting Authentic jerseys, that can be a bit trickier. It’s easier for factories in China to knock these off and they are much more lucrative, so their are fakes. If you go on Ebay, you’ll see Steph Curry Warriors Champion jerseys…obvious fakes since Champion hasn’t made a jersey since 2001-2002. It’s easy to knock-off the polyester construct of the jersey and then add the tackle-twill logos/letters/numbers. I would stick to players that were big during the 90s and stay away from any players/designs from 1997-1998 season on (unless they played for the following teams: Atlanta, Indiana, Los Angeles Clippers, New Jersey, Orlando, Philadelphia, Phoenix, Seattle, Utah and Vancouver). Starting 1997-1998, Champion was making authentic jerseys for these 10 teams only. From 1991-1992 through 1996-1997 Champion made authentic jerseys for all teams. I wouldn’t buy any obscure players, since Champion only produced authentic jerseys for popular players of that era (Jordan, Ewing, David Robinson, Kemp, Larry Johnson, etc). Champion Authentic jerseys do NOT have the Champion “C” emblem patch on the tank…they just have the NBA logo and the NBA logo is stitched into the fabric (it’s not a separate patch glued/sewn onto the jersey like on the replicas). HOWEVER, the exception is the Reggie Miller Pacers authentic jersey…it’s the only authentic jersey to sometimes have the Champion logo along with the NBA logo. Also, authentic jerseys will always be 100% polyester. If you see a gold NBA logo, that just means it’s a NBA 50th Anniversary edition and was produced during the 1996-1997 season…these tend to be a tad more collectible. Finally, as far as the jock tag goes, any authentic jersey produced during the 1996-1997 season or prior just has the basic jock tag that you would find on a typical replica jersey. However, in 1997-1998 when Champion’s license was restricted to only producing authentics for the 10 teams (Atlanta, Indiana, Los Angeles Clippers, New Jersey, Orlando, Philadelphia, Phoenix, Seattle, Utah and Vancouver) they went to a dual jock tag. These jerseys have the typical size jock tag (36, 40. 44, 48, 52), but also have another jock tag next to it that says “designed exclusively for the athletes of the NBA.” If you see a dual tag on any replica jersey that you can date to 1996-1997 season or before, I would not buy it. This would indicate its was actually issued to that player/team and should be game-used, so the price would subsequently reflect that. I hope this all makes sense and helps! Eventually I’ll add a section of Authentics. Any idea where i can find a white mark price size 48 jersey? thanks. Your best bet is to just keep checking Ebay. The early 90s Mark Price Cavs Champion jersey (1991-1992 through 1993-1994) comes up about once a month on Ebay in size 48. It usually goes for about $60 to $80. HOWEVER, with the Cavs finally winning a championship and Champion jerseys starting to really blow up, I’ve seen it recently sell for over $150. So I suggest patience and timing unless you are willing to spend over $150. Hey hows it going? Been referring back to your site several times to double check the authenticity of a jersey. Thanks for that!!! In addition, do you sell any of your jerseys? I’m in the midst of doing my own personal collection. If you are, shoot me an email, it’ll be provided, Thanks again! Thanks for checking out my site. It’s a constant work in progress….I work on it when I have time, which unfortunately isn’t often. I sold off my collection over the years and only have about 10 jerseys at any given time these days. 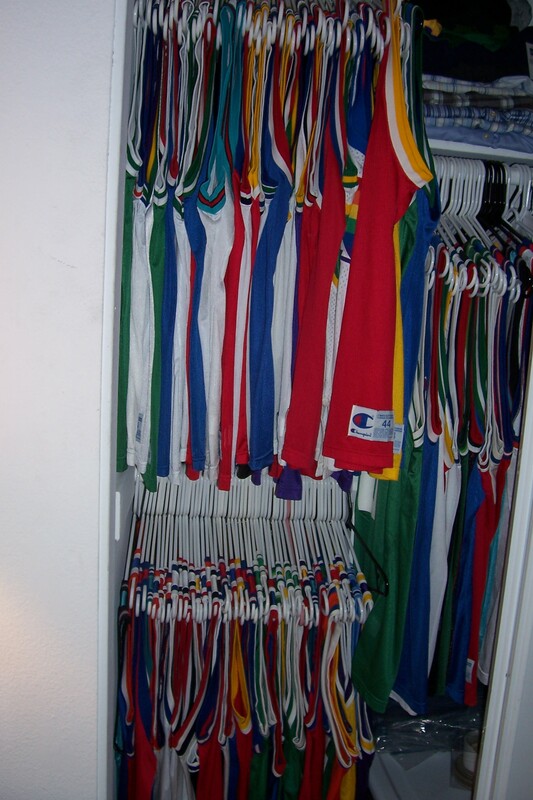 Five or ten years ago I would have about 300 jerseys in my closet at all times, but now this website is how I get to focus on my obsession without taking up my girlfriend’s valuable closet space. This is a great site. I have used it several times to check the authenticity of purchases I’ve made. Also the archive is deeeeeeep! I wasn’t aware that Champion even issued replica’s for some of these players (The Nets Yinka Dare jersey is my new Grail). I know this a site dedicated to replica’s, but I had a question about a Clyde Drexler Champion pro cut jersey I recently purchased for a relatively cheap price. Hopefully somebody can answer the question. The 2nd jock tag indicates the jersey was made for the 96/97 season, however it does not have a gold NBA logo patch, instead it has the normal blue and red patch. I have some other legitimate 90’s Champion pro cut jerseys and the Drexler jersey is the exact same quality in terms of material, stitching, and detail. I would be shocked if a counterfeiter made this jersey. I guess my question is: did all Champion jerseys made for the 96/97 NBA season have a gold logo patch? I have seen a few other 96/97 pro cut jerseys with blue/red logo patches for sale on eBay by reputable sellers, but the vast majority for sale on the internet have a gold logo patch. I love your collection and your knowledge about this stuff is amazing! Player practice jerseys by Champion! I have a Kobe Bryant reversible practice jersey from the All Star Game 1998. On ebay you can find a very few player practice jerseys from the All Star Games 1997 and 1998 but that´s it. Did Champion only put this jerseys for sale this 2 years or did they do that more years and they are just very rare to find?